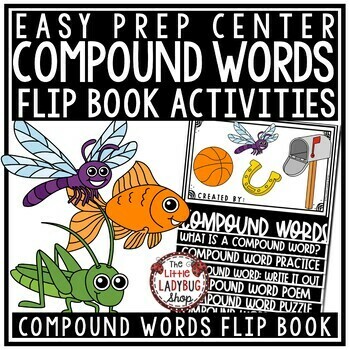 Compound Words Activity • Compound Words Flip Book is the perfect companion for you to use as you teach your students about compound words! They will love completing this flip book and seeing them displayed with their hard work! 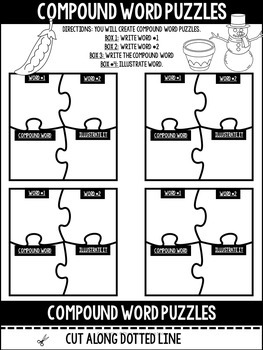 This flip booklet has fun ways to have students learn and practice this language skill! 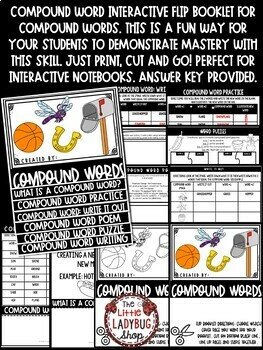 ⚫This booklet is to be printed on regular paper. ⚫Cut pages on the dotted line that is on page. ⚫Stack you Pages neatly allowing corners to meet neatly. ⚫Staple the pages at the TOP 2 corners and 1 staple in the middle holding the pages together. ⚫Your Interactive Flip Booklet should turn out perfectly!